The Arc-Flash Relay PGR-8800 utilizes built-in redundancies and health monitors to make maintenance and installation tasks more efficient. Among many other features, it offers fault verification abilities through optimal current detection. Durable and flexible sensor design, which eliminates breakage and two types of light sensors (point & fiber optic) for different applications. 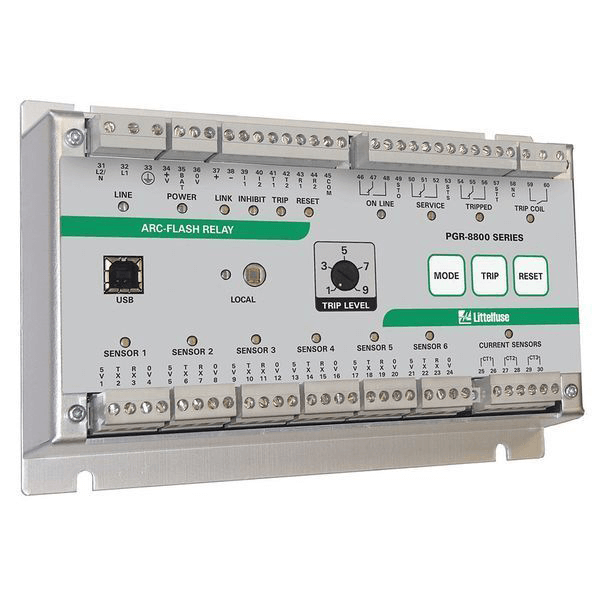 The PGR-8800 is a microprocessor-based arc-flash relay that limits arc-fault damage by detecting the light from an arc flash and rapidly tripping. Phase-current-transformer inputs are provided for current-constrained arc-flash protection. When so equipped, a programmable definite-time overcurrent function can be enabled. An optical sensor on the PGR-8800 and adjustable trip level reduce the chance of nuisance tripping by setting a threshold for ambient light. Sensors, inputs, and connections are monitored to ensure fail-safe operation. A secondary solid-state trip circuit provides a redundant trip path. A USB port is used for configuration and access event logs and graphs. The PGR-8800 accepts PGA-LS10 point sensors and PGA-LS20/ PGA-LS30 fiber-optic sensors in any combination, and is marine approved by ABS and DNV/GL.